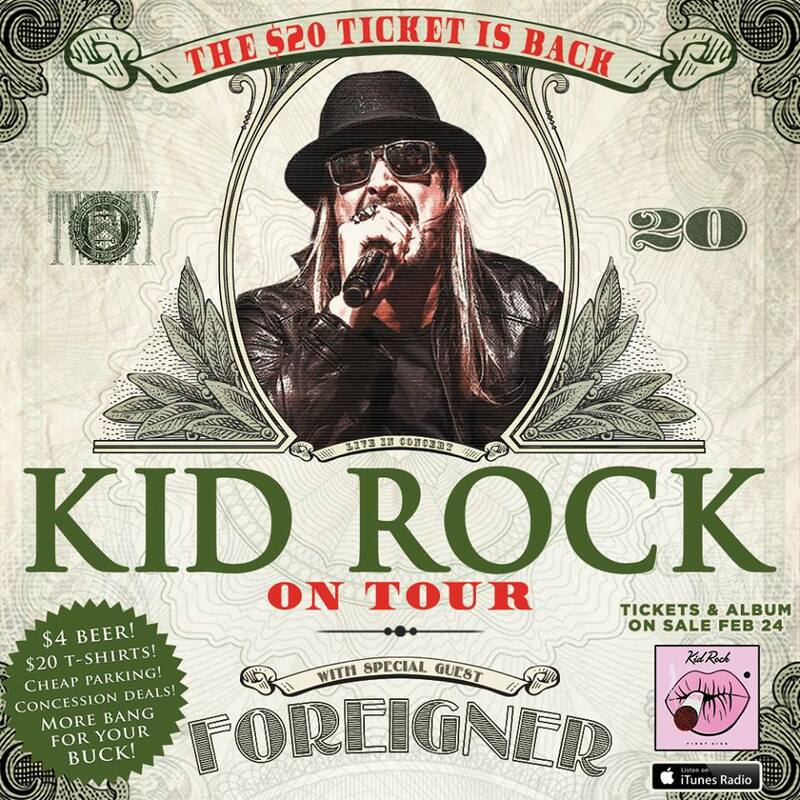 Kid Rock has announced a 2015 North American tour billed as The $20 Ticket Is Back! with 6 special nights in Detroit, that will kick off June 24th in Hartford and wrap up September 5th in Washington. Joining him on the tour will be rock legends Foreigner. The tour is in conjunction with Kid Rock's upcoming album, First Kiss. When do Kid Rock 2015 tickets go on sale and what is the presale code? Each date can be different, so be sure to check below for whichever concert you’re interested in. The first round of presales begin on Thursday, February 19th at Noon EST for Kid Rock Fan Club members. Fan Club Bundle and First Kiss Album preorders begin Friday, February 20th at 12:00 EST. Tickets go on sale to the general public Tuesday, February 24th at 10:00 EST. The Fan Club Bundle and the First Kiss Album presale codes will be emailed to you when you preorder the First Kiss album via the Kid Rock official website. We highly recommend you sign up for a fan club membership to get the latest updates. If you want great tickets for a reasonable price, check out Zumic’s preferred ticket broker: SuperStar Tickets. Use discount code SHOPCONCERTS for 5% off your purchase. For Kid Rock's latest music, news, and tour dates, check out his Zumic artist page.